At the outset, may I say that I have not been impressed with the results of conservative therapy of well-advanced achalasia. As a matter of fact, the results have been uniformly disappointing. In the earlier stages, the patients learn to change their eating habits and seem to get along in reasonable comfort. Various parasympatholytic and sympatholytic drugs have been tried extensively with practically negative results. The one remaining nonoperative measure which has been used widely is instrumental dilatation. The regular passage of an olive – tipped bougie through the cardia or a mercury-weighted rubber tube may permit the patient to carry on a relatively normal existence. I have known patients who learned to pass the mercury-weighted tube by themselves just before each meal and continued with this treatment for many years. It seems to me that there is some danger in this form of treatment in patients with the S-shaped deformity. Because of the tortuous elongation of the organ, direction of the dilating agent toward the cardia is difficult, and perforation might ensue should too much force be exerted. Fig. 17. Carcinoma of the cardiac end of the stomach in a patient with longstanding achalasia. There is one remaining type of conservative therapy, if it can be called such. I refer to the use of forceful dilatation by the employment of mechanical devices such as the Mosher apparatus, the Starck dilator, and the hydrostatic dilator of Plummer. While a few good results have been reported, most writers on the subject believe this method of forceful dilatation is dangerous and ill-advised. I have seen three examples of tearing of the lower esophagus following such therapy with subsequent mediastinitis requiring extensive surgery. The surgical treatment of achalasia has and is still going through many vicissitudes. It sems pertinent to stress the fact that, up to the present writing, there is no operative procedure which can assure every patient with achalasia that lasting relief will be obtained. With so little known concerning the essential mechanisms involved in this disease, one is forced to the conclusion that the operations utilized today are makeshift procedures with unpredictable results. With a demonstrable constriction in the lower esophagus, the obvious mechanical approach to the problem would be the fashioning of an anastomosis between the dilated esophagus above the constriction and the upper stomach. In fact, this was first proposed by Heyrovsky who used a U-shaped anastomosis, after the manner of a Finney pyloroplasty, between the esophagus and the proximal greater curvature of the stomach and, also, by Grondahl who made a simple lateral anastomosis. About 20 years ago, I considered the Heyrovsky procedure the operation of choice for achalasia and carried it out on 22 patients. The immediate relief of symptoms was dramatic but, as time went on, over 40 percent developed severe esophagitis due to reflux from the stomach, with bleeding, stenosis, and recurrence of dysphagia, more severe than before. The resulting disability required subsequent extensive surgical procedures before relief was attained. As a result of this experience, I would advise emphatically against the employment of any operation which permits reflux of gastric contents into the esophagus. I believe it was Evarts Graham who popularized a revival of the myotomy operation reported by Heller in 1914, a procedure known everywhere by his name. At best, it must be considered a simple makeshift procedure which does not attack the underlying mechanism that causes the disease. It aims to remove the obstructing factor in the same way as one carries out the Ramstedt procedure for hypertrophic pyloric stenosis, but it does not restore the normal peristaltic activity of the esophagus. Although there was much satisfaction among surgeons when the operation was first revived, extensive experience with it since then has dampened somewhat the original enthusiasm. From my own experience with this procedure, I am able to draw four significant conclusions. In the first place, the immediate and late results with respect to alleviation of symptoms are unpredictable. Some patients respond dramatically, while others do not. Secondly, the results are far better and more lasting with the first variety of achalasia than with the second S-shaped type. Thirdly, I have seen 11 examples of reflux esophagitis following a properly performed Heller operation. 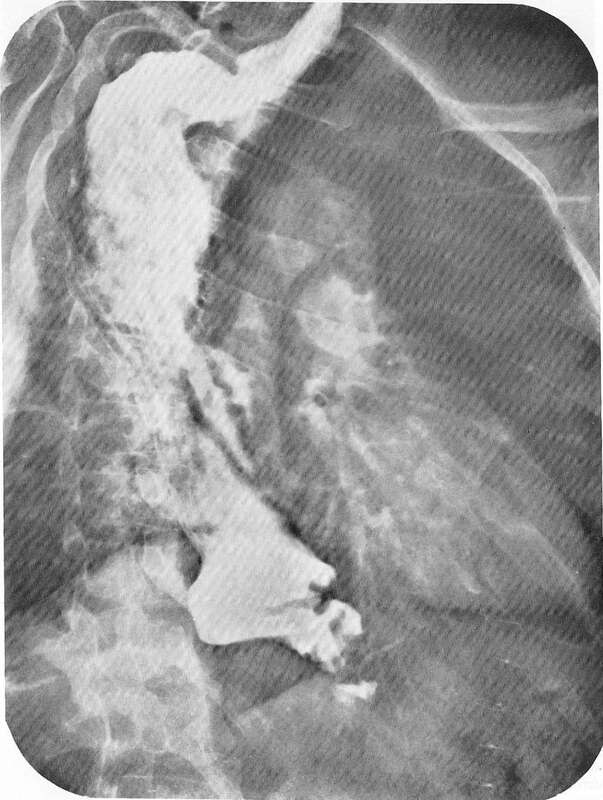 Lastly, I have been disappointed with the appearance of the x-ray films of the esophagus in the follow-up period. Orderly peristaltic activity is not restored. There may be marked delay in the passage of the barium one day and rapid passage the next. In the S-shaped or sigmoid deformity, decrease in size of the esophagus rarely takes place (Figs. 13, 14, 15). Some diminution in the width of the esophagus may occur in the first variety of the disease. I have noted a 50 percent decrease in size one week after operation. In spite of these reservations, I still am of the opinion that the Heller operation is, at the present moment, the procedure of choice. The surgeon should, however, expect disappointments.